Runtime: 6 min. 46 sec. 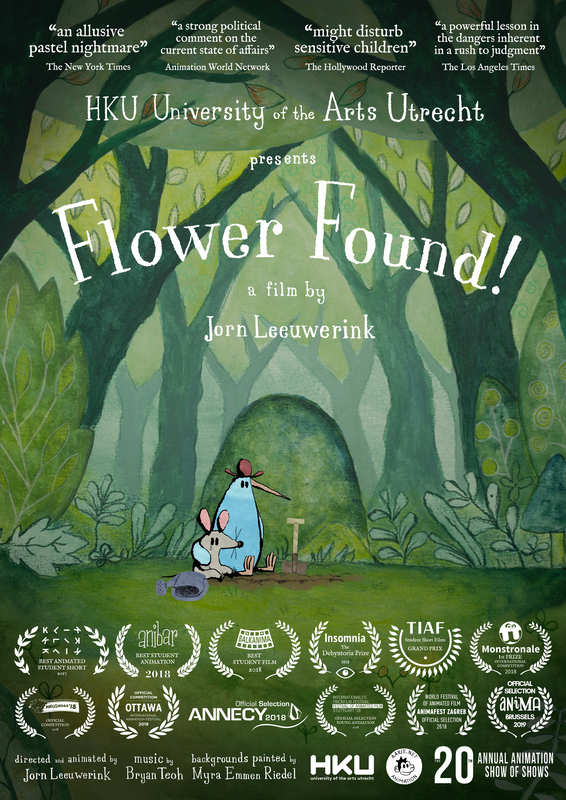 "Again hewing to the darker side, the Dutch animator Jorn Leeuwerink's deceptively childlike Flower Found! creates an allusive pastel nightmare of mistaken identity and mob injustice. 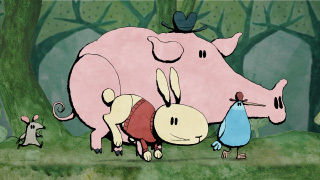 Digitally animated on painted watercolor backgrounds, the story follows an anxious mouse who learns that enlisting a search party of woodland creatures to find his stolen blossom might not have been the best idea." "Jorn Leeuwerink's Flower Found, which won the Best Student Short Film Award, is definitely strong enough to compete on equal footing with professional films. The 6 minute 46 second film starts off with a little mouse going to water his flower which he has been lovingly tending, only to find that his flower has disappeared. As he goes on a hunt to find his missing flower he is joined by all of his forest friends. The film starts out like a light hearted romp set to delightful music composed by Bryan Teoh. It doesn't give the viewer a clue about the gruesome end to the film which is a strong political comment on the current state of affairs where wild accusations are too often thrown without proof leading to disastrous consequences." "The simply rendered animals in Jorn Leeuwerink's Flower Found! present a powerful lesson in the dangers inherent in a rush to judgment. The charming naivete of the animals' looks belies the folly of their actions." "This animation has an adorable, cartoonish aesthetic that initially made me expect a completely different kind of story. As it is, it managed to surprise me with its dark humour and biting satire of busybodies who take over a worthy cause and twist it into something unrecognisable and awful. A message for grown-ups slyly delivered with childlike drawings." "Pictographs in word balloons replace speech: From the Netherlands, Jorn Leeuwerink's Flower Found! 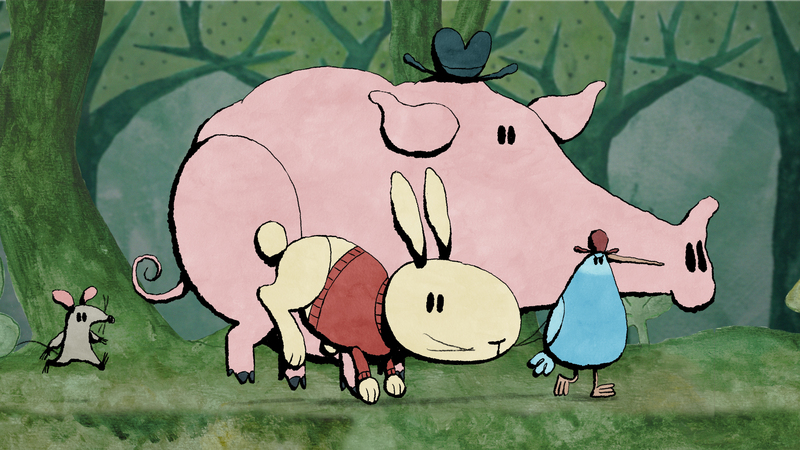 begins as a sweet kids' tale (albeit one with a Philip Guston visual influence) in which all the animals of the forest team up to help a little mouse find the pretty flower he lost. Things don't go as planned, though, and this is one of two shorts featuring moments that might disturb sensitive children." "Jorn Leeuwerink's Flower Found! takes an overly familiar children's story to adult extremes. When a mouse discovers a flower missing from its garden, it turns to various animal friends to help find the missing flower's whereabouts. This charmingly innocuous search soon takes on a darker tone while staying age-appropriate. Then again, compared to the fates befalling mischievous children in a typical Der Struwwelpeter story, the finale of Leeuwerink's short may seem comparatively tame." "This was the most surprising of the bunch - its dark humor and grave conclusion unforgettable. What starts as an innocent search for a missing flower turns swiftly into a poultry-themed witch hunt, with guilt and false accusations left in its wake. ... viewers are left in shock - though with deep understanding of our culture. Too often, we are swift to make decisions based on small bits of information - even if that information is found to be false. We are not easily swayed from our preconceptions of what a thing is and how the situation should go. Our rash judgments bring inexplicable harm to those who are innocent. We need to take the time to listen to all sides, even if we disagree. We need to strive to obtain as must information that is readily available to us, before making a final decision. As the flower was marked with characteristics the chicken shared, he was automatically called a flower. By stereotyping based on what we look like, we are leaving guilt and false accusations in our wake. We condemn a race, gender or sexual preference into a category of unchangeable characteristics that continue to created a forced viewpoint. By not expanding our lines of thought, we are restricting and damaging the lives around us. Only by getting to know the person in front of us for who they truly are can we look beyond." 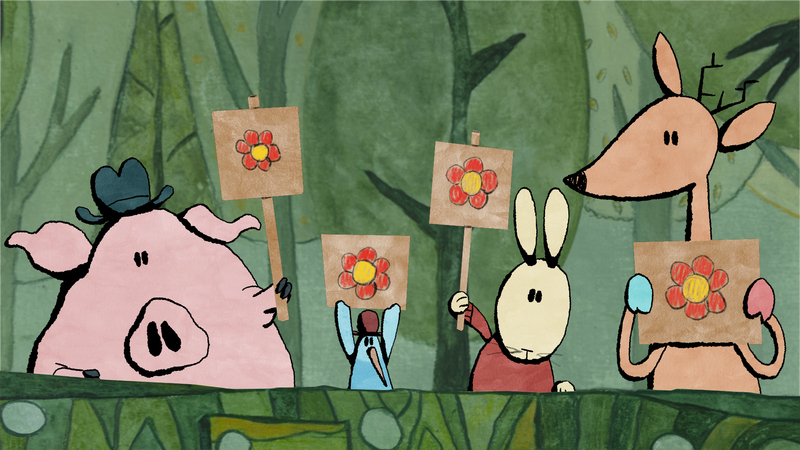 "Leeuwerink's disarming fable opens as a cutesy animal caper and ends as an utterly bleak indictment of mob hysteria. 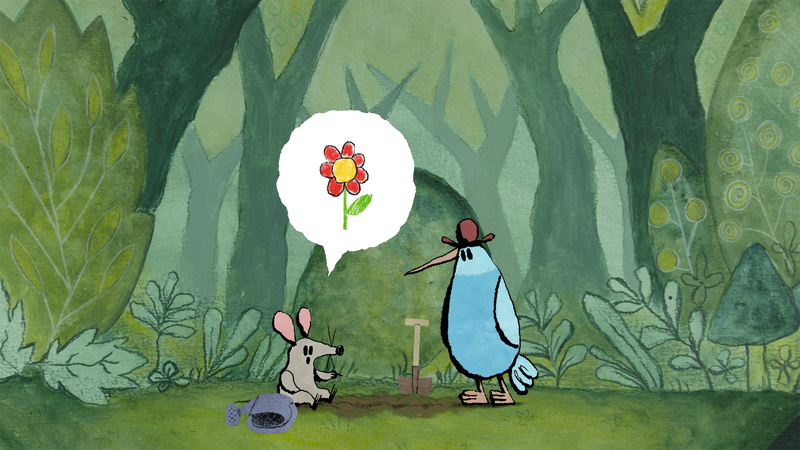 When a mouse discovers that its favourite flower has been stolen, it enlists its forest friends to help recover it. But they get carried away with their task, resulting in a horrific miscarriage of justice. In the context of the programme, Flower Found! felt like a political work, even if its message is cloaked in allegory. Leeuwerink has form in mordant satirical cartoons, but this, his graduation film from HKU University of the Arts Utrecht, is his strongest yet. The plot is perfectly paced, keeping the audience guessing as it shades from comedy into horror, then tragedy. It has been on the festival circuit for a while, and every time I see it, I'm struck by its narrative clarity and purpose - no mean feat, especially for a student film. It won Anima's award for best student film." "The program also includes some films with unexpected twists such as Flower Found which follows a growing parade of super cute characters who all take some surprisingly dark and disturbing turns before the credits roll." "Jorn Leeuwerink's Flower Found! just might be the most subversive film of the year-any year. It starts out as a cute animal tale in which all the forest creatures help a mouse look for his missing flower, but it takes a dark turn that illustrates the dangers of group thinking and mob justice. Seriously, this one is not for kids. It will even leave a mark for most adults."